We are now selling Rent to Own portable Premier Buildings, shed houses, metal building, garages, cabins, and more check us out pn facebook: premier portable buildings in Jacksonville, TX and www.facebook.com/shadypinesrvpark.net. ​ Welcome to Shady Pines here in Jacksonville, Texas. With on-site owners support available 7 days a week, we'll make sure your stay here is one to remember. Be sure to check out our facilities and take a look at our park map! Washers and Dryers were upgraded added 1 to front load for larger loads and we also have a laundry service on site to accommodate anyone's work schedule or disability's. 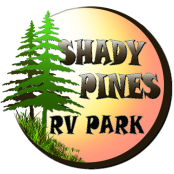 We have the laundry facility well lit up and plenty of benches, chairs and a swing to sit outside to enjoy nature and pretty gardens any time of the day, all week long for the convenience for folks at Shady Pines RV Park & campground. Just two more services we want to provide for our residents! Take a look at our park facilities. We know you'll enjoy your stay here at Shady Pines!